Addressing unhealthy lunchtime choices, this parent complaint letter can be sent to the school system or administrators. 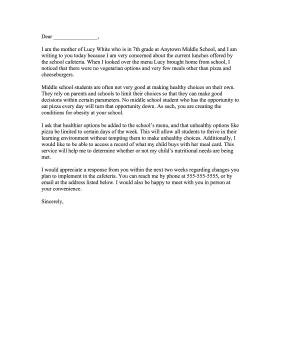 I am the mother of Lucy White who is in 7th grade at Anytown Middle School, and I am writing to you today because I am very concerned about the current lunches offered by the school cafeteria. When I looked over the menu Lucy brought home from school, I noticed that there were no vegetarian options and very few meals other than pizza and cheeseburgers. Middle school students are often not very good at making healthy choices on their own. They rely on parents and schools to limit their choices so that they can make good decisions within certain parameters. No middle school student who has the opportunity to eat pizza every day will turn that opportunity down. As such, you are creating the conditions for obesity at your school. I ask that healthier options be added to the school's menu, and that unhealthy options like pizza be limited to certain days of the week. This will allow all students to thrive in their learning environment without tempting them to make unhealthy choices. Additionally, I would like to be able to access a record of what my child buys with her meal card. This service will help me to determine whether or not my child�s nutritional needs are being met. I would appreciate a response from you within the next two weeks regarding changes you plan to implement in the cafeteria. You can reach me by phone at 555-555-5555, or by email at the address listed below. I would also be happy to meet with you in person at your convenience.